For me books have always been a huge part of my life. To be able to escape into another world for a few hours can be so thrilling, so relaxing, so terrifying and so delightful and something that I want both of my children to be able to enjoy for themselves. Mr B and I have read to both children, nightly, from a very young age and the boy has a true passion for books and can amuse himself for hours, looking at the pictures and reciting them from memory. Little Miss is also showing early signs of developing the same enthusiasm. Being avid readers ourselves it is great to see this love of books in our children and something we shall continue to encourage in each of them. For any parents looking for advice on the best ways to encourage reading in pre-school children, or looking for suitable material for children of a certain age, look no further! 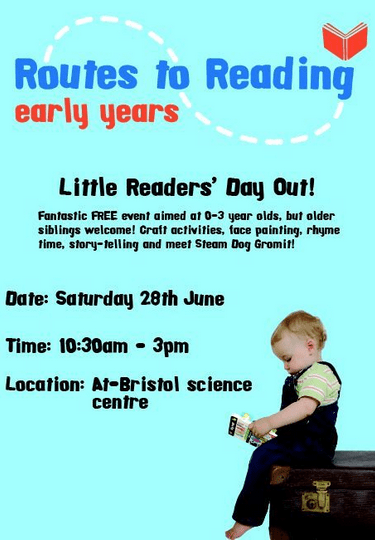 Little Readers’ Day Out is a free event aimed at helping parents to get the most out of reading books with their babies and toddlers. On Saturday 28th June in the At-Bristol science museum, parents will have the opportunity to take part in storytelling and rhyme time sessions with their little ones, and to speak to reading experts about their child’s reading journey. It’s going to be a fun-packed day out with popular children’s authors making guest appearances – Paul Stickland (Dinosaur Roar! ), Michelle Robinson (How to wash a woolly mammoth) and Jan Dobbins (Driving my tractor). There’s something for everyone; from parents who are yet to start reading to their baby to those who already read regularly. This is also an opportunity to join the baby book club and receive the best new books for babies and toddlers. As well as story telling sessions and rhyme-time there will be crafts and colouring, face painting, competitions and give-aways, guest appearances by well known book characters and a picture opportunity with Steam Dog Gromit. It promises to be a fabulous free event and great day out for any family with pre school children. The Little Redaers’ book club will officially launch at the end of June complete with a website packed full of reading tips and videos for parents to browse as well as an opportunity to upload their own. A chance to join the baby book club. To find out more do pop along to The Little Readers’ Day Out where I am sure you will have a fantastic time. What a great event – I so wished I lived closer and had little ones! Brilliant idea! I love that it other things as well as reading, i think that often works better with the little ones. Learning to love books is such an important skill to pass to your children. Thank you for sharing! No problem. I am sure it will be a wonderful day.